I am in The Referend Bier Blendery, drinking OED by The Referend Bier Blendery. 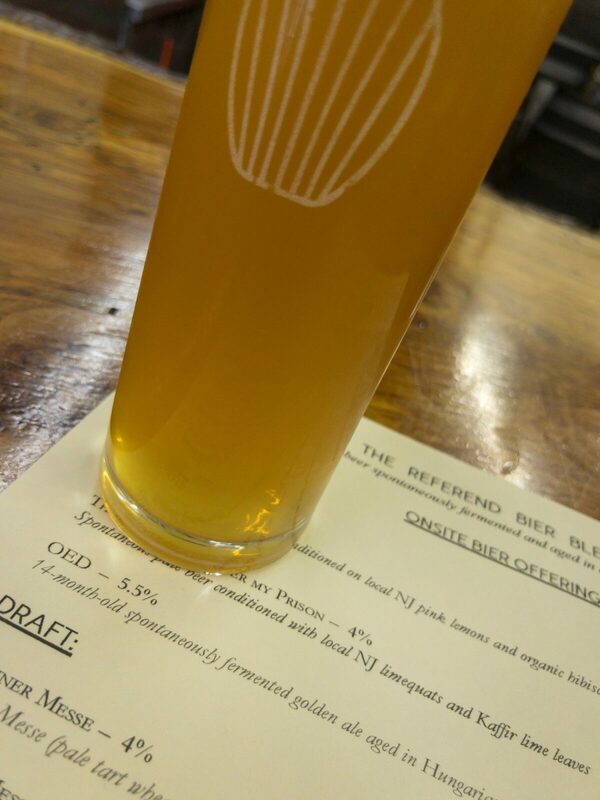 The Referend Bier Blendery is a Micro Brewery in Pennington, NJ. OED style is Lambic – Traditional, with an ABV of 5.5% and IBU of 0. I gave OED a 4 on Untappd’s 5 point rating system. Spontaneously fermented ale brewed with a turbid mash, a large proportion of raw wheat and aged whole leaf hops, an extended boil, a natural rate of cooling and spontaneous inoculation in our coolship, and fermentation and maturation in neutral oak vessels for a period greater than one year. Served still at cellar temperatures. I am drinking a OED by The Referend Bier Blendery @ The Referend Bier Blendery.